David Gervais has raised more than $105,000 in nine years of work with the fundraiser. LEWISTON — David Gervais is a dishwasher at the Bates College Commons. He’s worked in the college’s kitchens for 39 years, since graduating from Lewiston High School. He’s also a Dempsey Challenge fundraiser. A very good one. In his off time, he hustles by hanging hundreds of event posters around town and sending out 1,000 letters each summer for pledges. 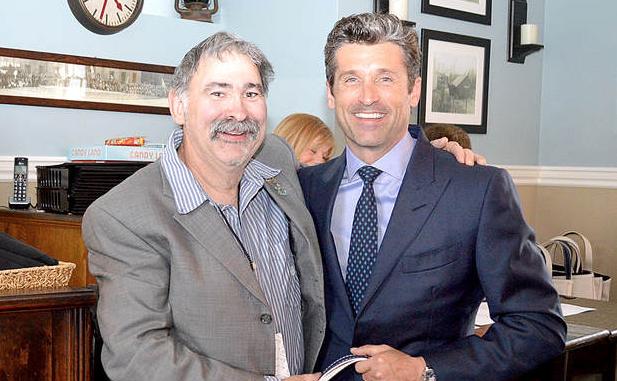 He jokes that he and actor Patrick Dempsey are “like that,” crossing his two fingers. Years ago, Gervais raised money for local diabetes walks, raising more than $100,000 over 12 years. His father had diabetes and the cause was special to him. But about the time those walks stopped, the Dempsey Challenge started up as a key fundraiser for the Dempsey Center. “My mom had friends who died of cancer,” he said. It made sense to shift his energies. In the first eight challenges, he raised more than $87,000. So far this year, headed into this weekend’s ninth annual event, it’s $18,448. Butler Bros. in Lewiston has each year matched or contributed to Gervais’ total, giving $5,000 this year. John Butler Jr., the company founder’s son and a high school classmate of Gervais, said his sister beat breast cancer, which made the Dempsey Center’s work important to them. He’ll walk the Dempsey Challenge 5k with Gervais on Saturday. For the second time, Gervais will bike as well on Sunday, the 10.6-mile route. “Two years ago (Patrick Dempsey) said, ‘Dave, you should do the biking, too,’ and I said, ‘OK,’” Gervais said. When it comes to fundraising, in addition to the letters, he goes door to door in familiar neighborhoods. At Holy Family Church, where he’s the head usher, the parishioners have been great, he said. Most donations are modest, $5 to $15, but they go up to an annual check for $1,000 from one donor. Dani Campbell, the Dempsey Center’s marketing manager, said it’s been amazing to see how much Gervais does year after year. Gervais is greeted with hugs each time he goes in. There’s just a joy in helping people, he said.